If you have an Amazon S3 account, you can take advantage of Amazon's un-managed pricing and use Jungle Disk to simply move data to your Personal S3 account. Note: The Jungle Disk Support team can offer only limited support for problems with Personal S3 containers. First you will need to log-in to your Amazon S3 account at Amazon Web Services. Go to the "Security Credentials" section under "My Account / Console" and log-in. Once logged in, you will be in the Security Credentials section of the Amazon S3 Control Panel. Go to the "Access Keys" section and expand this section. Here you will find a list of your Access Keys. Note: Amazon no longer provides a way to recover Secret Keys. To create a new Access Key / Secret Key pair, make sure you have less than two active / inactive Keys and click "Create New Access Key". Make sure you sure you click "Download Key File" or keep this key in a safe place, as lost keys are unrecoverable. Once you have logged-in to the Online Control Panel, go to tab in the upper left hand corner marked, "Online Disks", and click on the drop down to select "Amazon S3 accounts. Once in, enter a nickname to help you remember which Amazon S3 account this is tied to, the Access Key and Secret Access Key. Afterwards, you can select "Online Disks" tab in the upper left hand corner and select "Manage Online Disks". 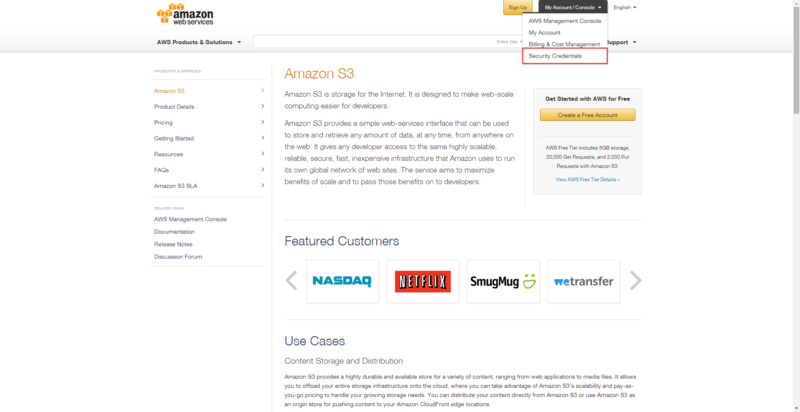 You can now choose your Personal Amazon S3 account as your storage provider when creating new Online Disks.